ORNL's Charles Seipp synthesized a simple compound known as guanidine that was found to bind strongly with carbon dioxide directly from the air and form insoluble carbonate crystals that are easily separated from water. 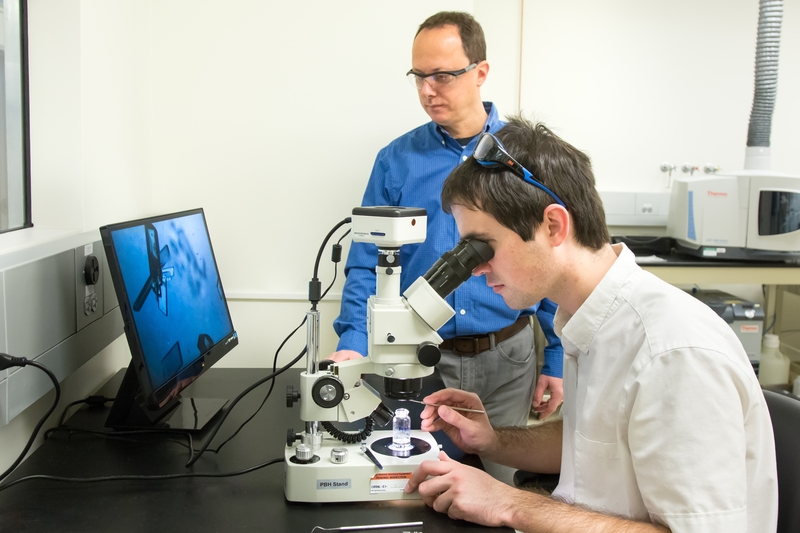 ORNL researchers Radu Custelcean and Charles Seipp study crystals that had absorbed carbon dioxide from ambient air. This simple compound would require minimal energy and chemical input if used in existing carbon capture and release strategies. 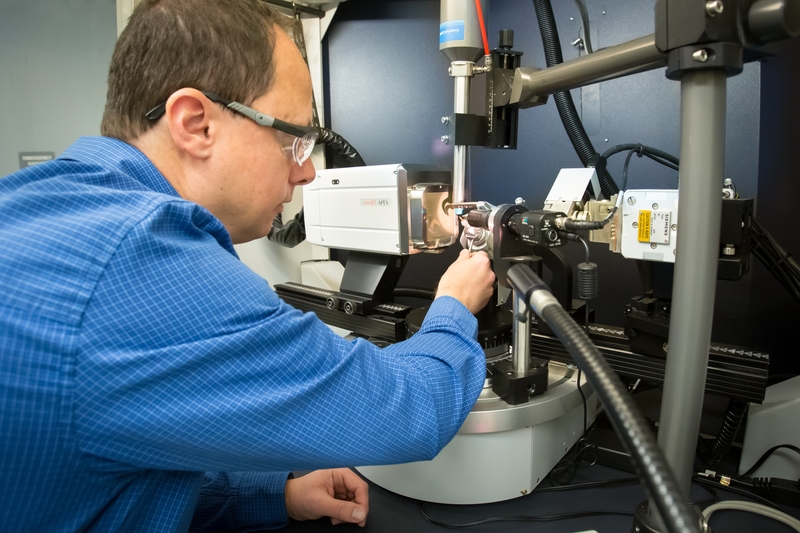 Using X-ray diffraction, ORNL's Radu Custelcean analyzed the molecular structure of the simple guanidine compound and was surprised to find carbonate, a crystal that forms when carbon dioxide from air reacts with water. When an aqueous solution of a simple guanidine compound was open to air, beautiful prism-like crystals started to form as the material absorbed carbon dioxide. OAK RIDGE, Tenn., Jan. 9, 2017 – Scientists at the Department of Energy’s Oak Ridge National Laboratory have found a simple, reliable process to capture carbon dioxide directly from ambient air, offering a new option for carbon capture and storage strategies to combat global warming. Initially, the ORNL team was studying methods to remove environmental contaminants such as sulfate, chromate or phosphate from water. 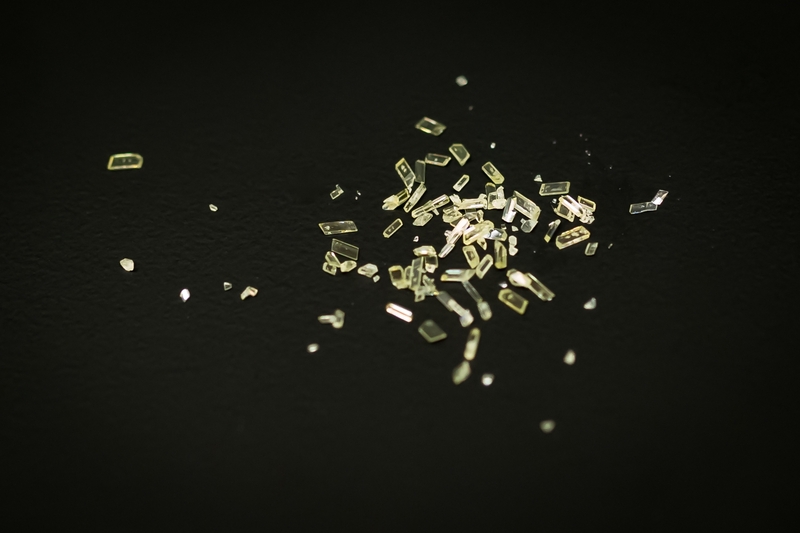 To remove those negatively charged ions, the researchers synthesized a simple compound known as guanidine designed to bind strongly to the contaminants and form insoluble crystals that are easily separated from water. In the process, they discovered a method to capture and release carbon dioxide that requires minimal energy and chemical input. Their results are published in the journal Angewandte Chemie International Edition. Decades of research has led to the development of carbon capture and long-term storage strategies to lessen the output or remove power plants’ emissions of carbon dioxide, a heat-trapping greenhouse gas contributing to a global rise in temperatures. Carbon capture and storage strategies comprise an integrated system of technologies that collects carbon dioxide from the point of release or directly from the air, then transports and stores it at designated locations. A less traditional method that absorbs carbon dioxide already present in the atmosphere, called direct air capture, is the focus of ORNL’s research described in this paper, although it could also be used at the point where carbon dioxide is emitted. Once carbon dioxide is captured, it needs to be released from the compound so the gas can be transported, usually through a pipeline, and injected deep underground for storage. Traditional direct air capture materials must be heated up to 900 degrees Celsius to release the gas -- a process that often emits more carbon dioxide than initially removed. 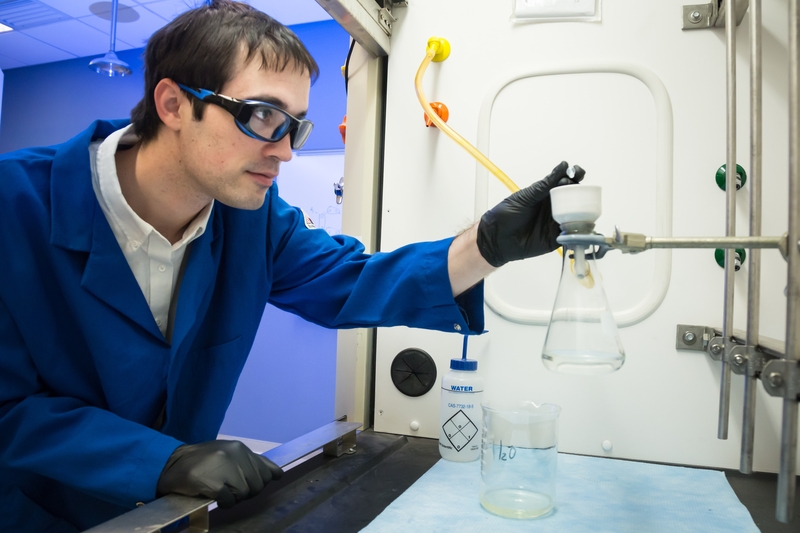 The ORNL-developed guanidine material offers a less energy-intensive alternative. While the direct air capture method is gaining traction, according to Custelcean, the process needs to be further developed and aggressively implemented to be effective in combatting global warming. Also, they need to gain a better understanding of the guanidine material and how it could benefit existing and future carbon capture and storage applications. The research team is now studying the material’s crystalline structure and properties with the unique neutron scattering capabilities at ORNL’s Spallation Neutron Source (SNS), a DOE Office of Science User Facility. By analyzing carbonate binding in the crystals, they hope to better understand the molecular mechanism of carbon dioxide capture and release and help design the next generation of sorbents. The scientists also plan to evaluate the use of solar energy as a sustainable heat source to release the bound carbon dioxide from the crystals. The study titled, “CO2 Capture from Ambient Air by Crystallization with a Guanidine Sorbent,” included Charles Seipp of ORNL and the University of Texas at Austin; Neil Williams of ORNL and the University of Tennessee; and ORNL’s Michelle Kidder and Radu Custelcean. The research was funded by DOE’s Office of Science.